While I did a great job in January and February sticking to my new year’s resolution to bring lunch to work more often (only purchasing lunch twice each month! ), March has been a complete blowout. I think I’ve probably failed to BMOL (bring my own lunch) somewhere between six and eight times. It’s not easy keeping this resolution, and requires a bit of planning, so in that interest I decided to throw together a quick pasta salad…which I of course pinned! Directions: In a large pot of boiling, salted water, cook ¾ lb ziti until al dente. Drain. 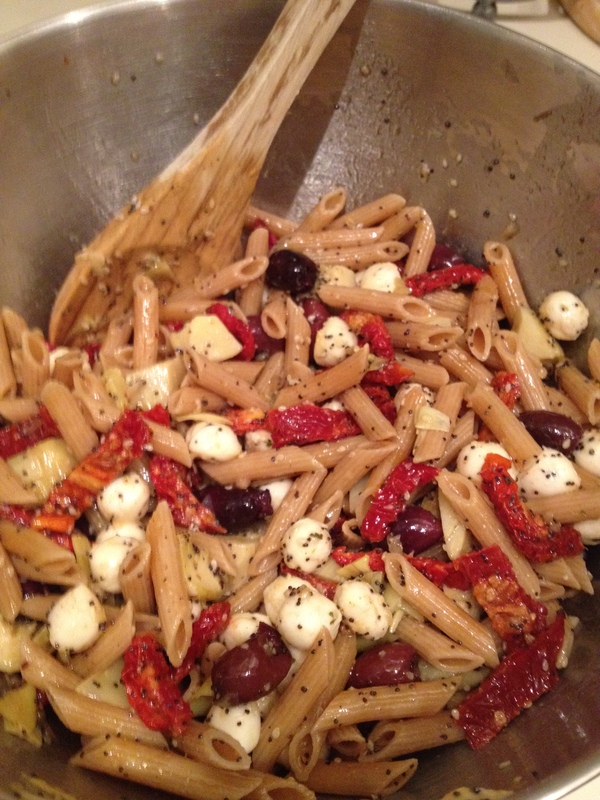 In a large bowl, combine ziti, diced mozzarella, chopped fresh basil, slivered sun-dried tomatoes, marinated ­artichoke hearts, black olives, bottled Italian dressing (or dressing of your choice), and pepper. Sprinkle with grated Parmesan and fresh basil. Add salt to taste, if desired. I put this title in quotation marks because while I thought it was pretty good, it definitely wasn’t the end all of dressings (in my opinion). Now, to be fair, I obviously left out the Dijon mustard so perhaps that is a key ingredient that altered the taste of the dressing. Although I cannot imagine a world in which mustard is the key to anything. Gross. Directions: Whisk together all ingredients. Store refrigerated up to 1 week. ← My kind of evening!